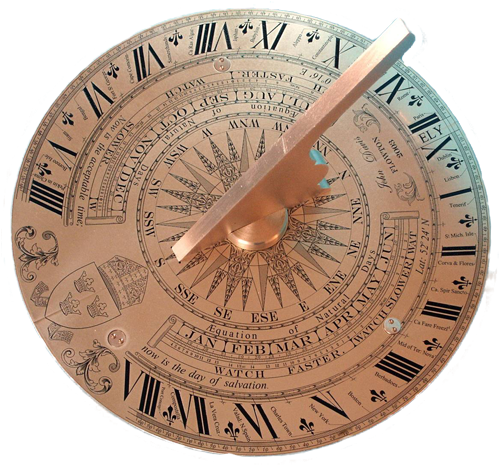 Flowton Dials design and make precision sundials on individual commissions. We specialise in replicas/reproductions of antique dials and also in modern dials with shadow lines showing birthdays and anniversaries. We also restore and repair antique dials and offer a design and consultancy service. Dials are typically in brass or bronze but can also be in anodised aluminium or vitreous enamel. They range from pocket sized to 2½ metres across. Unusual types, some incorporating sculptures, can be made. Flowton Dials is a one-man business so do not expect fast turn-around or mass-produced prices. Note: we do not work in stone or slate but can recommend or work with talented craftspeople who do. either by phone on 01473 658646 or by completing our feedback form.